Detail, originally uploaded by indiaeden. This kimono has sat in my UFO box for such a long time. 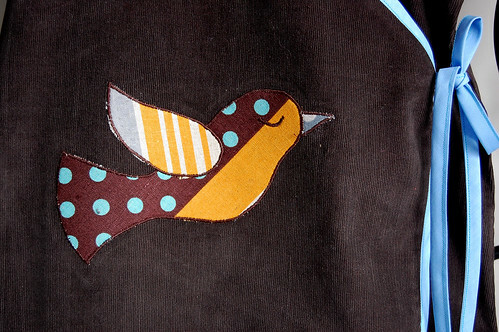 I whizzed it up on the sewing machine the other day, and now it needs a new home. I should warn you, my stitching on this is not up to my usual standards,but it's certainly serviceable. So if you have a little one you'd like this for just leave me a comment and I'll do a draw for a winner in a weeks time. 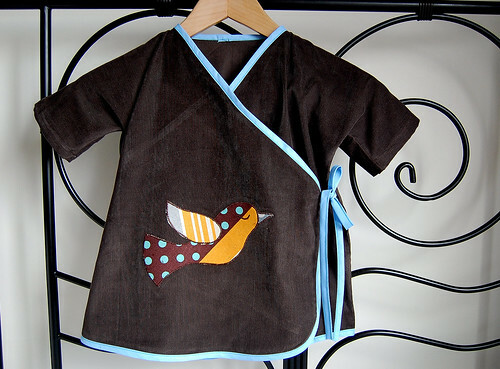 The kimono is made from cotton needlecord in a chocolate brown, and fastens with two little ties, one inside, one outside. The sizing on this is generous and will fit most 12-24 month olds. Looks lovely over a long sleeved t shirt or turtleneck, and with jeans or leggings. If you guys drop me a line at jeanette dot archer at gmail dot com with your addresses, I'll pop these in the post asap. I think of you and Florence a lot. I know that my sister would love the kimono for my neice, so please enter me in the draw. I've been thinking about you this week with the inquest... I'm glad you've had some comforting comments. Though I know it makes it no easier to accept. I would love to go in the draw for the kimono, for my neice, if possible. Oh my daughter would look lovely in that. Please enter me in the drawn. <3 You're one fantastic lady, Jeanette. Jeanette, I found your blog through TBW and have been reading for about a year now because I so admire your sewing. I have been holding your family in my heart since you lost Florence. I would be very thankful to be added to the draw. Om my gosh! Aren't I a lucky girl? I would be incredibly grateful to receive this kimono! Jeanette, I love all the clothes you make and the fabric you design. Pip would look fabby in this sweet wrap, so please add to me to the list for the draw! That is beautiful work, Jeanette, and I would be very honored to put it on my littlest daughter. I am glad to hear that you found some small comfort in some of the information given at the inquest - knowing that Florence passed away in the comfort and love of your arms must be a great relief. Jeanette, I've been reading your blog for so long but I haven't commented yet. That kimono is gorgeous, I'd love to be in the draw. That's beautiful. Please add me to the draw! You never fail to blow me away with the strength of your soul and your sweet generosity. I don't think I've ever commented on your blog before Jeanette, but I read regularly :) I'd love to be in the draw for the lovely kimono.